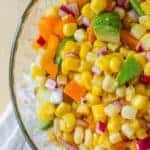 In a large bowl combine the corn, avocado, onion and sweet pepper. In a second bowl, combine the olive oil, white wine, sugar, salt and pepper. Mix well. Pour the dressing over the corn mixture and combine.